Promising Pages is proud to announce our partnership with Carolinas HealthCare System and Second Harvest Food Bank! Second Harvest Food Bank donated 37 million pounds of food to needy families in our area last year, and Carolinas HealthCare System (CHS) is one of the country’s leading and most ground-breaking healthcare organizations. CHS provides a wide range of healthcare and wellness programs throughout North and South Carolina, comprised of over 600 locations, including academic medical centers, hospitals, healthcare pavilions, physical practices, destination centers, surgical and rehabilitation centers, home health agencies, nursing homes and hospice and palliative care. According to their website, CHS’s core values are caring, commitment, integrity, and teamwork. Such great qualities are exactly what Promising Pages is looking for in book drive partners. But, how did this all start? CHS leaders first heard of Promising Pages when they attended the Charlotte Chamber’s Annual Retreat in Wild Dunes, South Carolina. It was here that Promising Pages announced their Big Hairy Audacious Goal (BHAG) to collect and redistribute 1 million children’s books to area kids who have few, if any at home. Promising Pages is now partnering with CHS and the Second Harvest Food Bank for the “Feed the Body, Feed the Mind” Campaign. 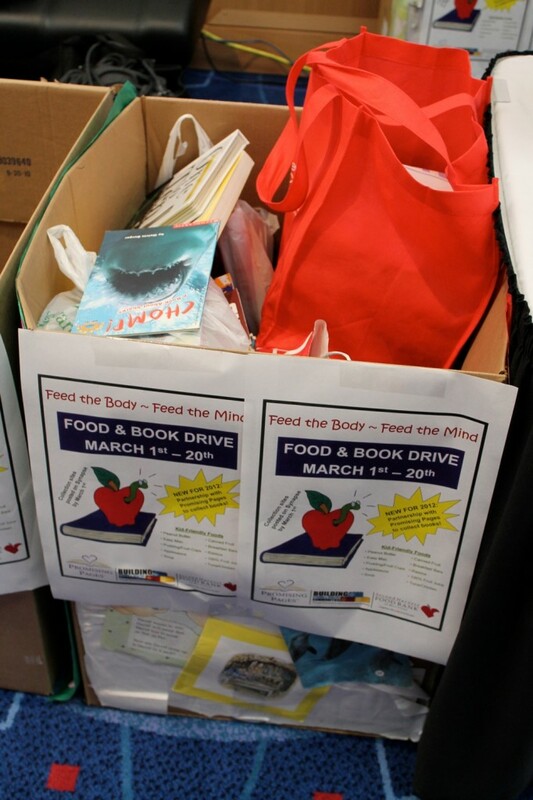 New and gently used kids books and food will be collected throughout the CHS March 1st — 20th at 300 area locations. To start our joint venture, Promising Pages attended the CHS Leadership Development Institute on Tuesday, February 12th in the Center Grand Ballroom of the Charlotte Convention Center. Approximately 1,300 employees attended the event, several of whom were very eager to take a photo with Erma the Worma, wonderfully performed by our founder, Kristina Cruise. Later on that morning, Flight Nurse Michael Nichols dropped by to learn more about Promising Pages. Michael was excited to hear we were collecting books: “I have a four and a six-year-old and a house full of books. I have books with the binding not even broken in.” He grew up in a household with hundreds of books as his mother is an elementary school teacher. Michael looks forward to donating books in one of the CHS drop boxes. By the end of the event, the Promising Pages drop box had collected over 300 books! This was only one event. Imagine how many books Promising Pages can amass with over 300 CHS locations! If you would like to donate new or gently used books, please contact us at promisingpages@gmail.com. I believe Promising Pages and CHS have entered the beginning of a beautiful friendship.